Dunfermline – history, comic book heroes and a mean lasagne! 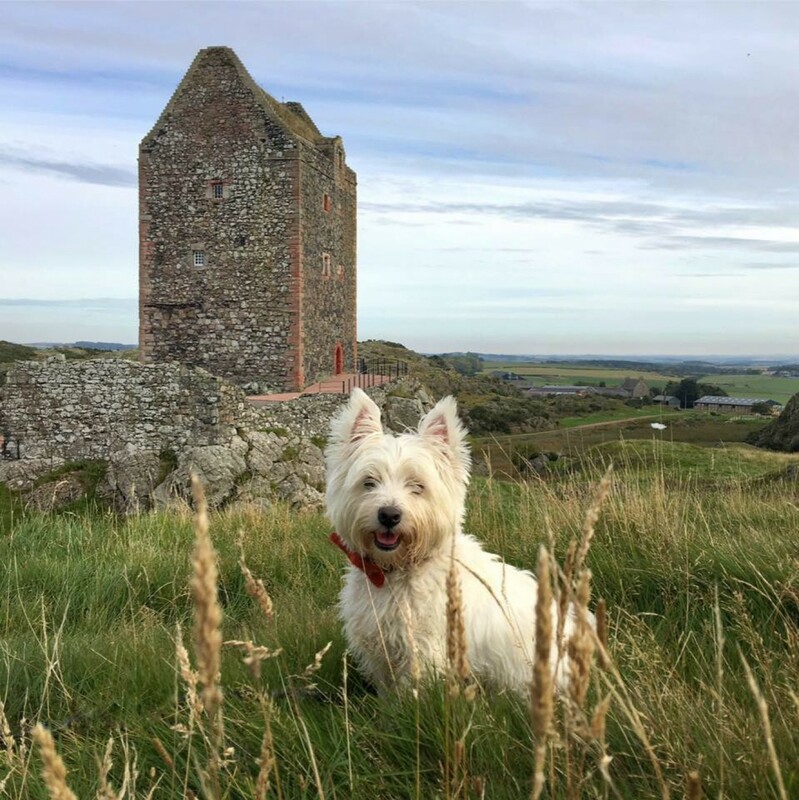 A mere 24 hours after returning home from a wonderful adventure in NYC, we were back on the road exploring Dunfermline with the hairy-faced, Wee White Dug – hooray. This time our travels took us to the fascinating, historic town of Dunfermline in the Kingdom of Fife. Dunfermline has been on my must revisit list for a very long time. It’s a short hop from Edinburgh, yet I haven’t visited since I was a fresh-faced history student in the 1990s. The medieval ruins and rich history are what originally drew me to the town, and they’re what lured me back some 20 odd years later. First things first though – coffee. Jet lag, and having just spent six crazy days in the Big Apple meant caffeine would be essential to prevent our heavy eyelids from winning a battle for sleep. We met up with Thomas from Visit Dunfermline and Colin, a talented comic book creator and photographer (our guide for the morning) at Cafe Fresh in the hub of the town’s historic centre. It was nice to drink coffee outside, in the cool Scottish air without fear of melting in 90-degree heat. En-route to admire magnificent, medieval ruins we popped into a fab, wee dog friendly shop called Little Shop of Heroes. Had The Teen not been immersed in a deep, jet lagged slumber back home, she’d have been in her element amongst the Marvel heroes lining the shelves in comic books. I was delighted to see Spidey adorning the entrance, as two days earlier I’d caught a rare glimpse of him out and about in Central Park. The boy lapped up the warm welcome he received and had fun meeting canine employee Atticus – a very handsome black spaniel. Before leaving, the Wee White Dug posed in the shop window. He said, it was just in case any of his fans walked by – big ego or what?! One look at him in the shop window and there was my ear worm for the day ‘How much is that doggy in the window?’ – now tell me you didn’t just sing along? Our first historic visit of the day was to Dunfermline Abbey. Founded as a Benedictine priory by Queen Margaret (Saint Margaret), it was given abbey status by her son King David I in 1128. St Margaret, her husband King Malcolm III and a host of other medieval royals were laid to rest at the abbey. It’s also the final resting place of King Robert I or Robert the Bruce. If pushed to choose a favourite Scottish historical figure it’d be Bruce. I’ve been fascinated by him since childhood, and was lucky enough to be taught by an eminent Bruce historian at university. If your knowledge of him extends to what you learned from the movie Braveheart, then please forget it all and find out the true story behind the Scottish hero. Once inside, I made a beeline for my hero’s grave. The boy posed as proud as Punch for photos beside his tomb. It all seemed quite surreal, my wee travelling dog paying homage to The Bruce. We bumped into a tour party of Swiss visitors who made a big fuss over the boy. He posed willingly for photos, before living up to his terrier reputation and emitting a low growl to announce that show time was over. We huckled him away to view the stunning abbey nave before he showed himself up further. The Nave, which is also known as the Old Church is all that remains of the 12th century abbey. Stepping inside is like stepping back in time to the medieval period – exquisite. It’s a beautiful, serene and calm place. The intricate stained glass windows cast a gorgeous, warm light on the walls and flagstone floor. It’s easily one of Scotland’s most impressive church interiors. The boy seemed subdued by the lovely ambiance and his bout of unruly behaviour subsided. It’s said William Wallace’s mother is buried in the abbey cemetery under a thorn tree. The remains of the once ornate shrine of Saint Margaret now sit in the churchyard just outside the modern-day parish church. The shrine was an important medieval pilgrimage site, and it’s possible that William Wallace may even have visited with his mother. The Protestant Reformation led to the destruction of such ornate Catholic shrines, and Scotland’s churches became cold, grey and stern places. After a good look around the abbey and its cemetery, we visited the ruins of Dunfermline Palace which was once a grand, royal home. James VI lived here with his queen, Anne of Denmark, and it’s where the ill-fated King Charles I was born in 1600. He was the last monarch to be born in Scotland. The boy loves exploring medieval ruins but he shook like a leaf inside the palace ticket office and shop. His shaking led to talk of ghostly goings on, and things that go bump in the night! Despite the best efforts of the lovely Nan from Historic Scotland, the boy was not for cheering up or lingering in the shop, so we left to explore the more airy, roofless parts of the palace. Once outside, and with lots of interesting corners to sniff, the boy was soon back to his old ruin exploring self again. I was in my element when I discovered a room with medieval stone carvings inside. I love them, as they’re usually so expressive and funny. My favourite was a water spout, carved to look like a man with a wide-open mouth. It’s amazing that hundreds of years later he’s still making people smile. After exploring the palace we said goodbye to our excellent guide Colin, and continued our historic tour of Dunfermline at the birthplace of a well known Scot more commonly associated with America. The Andrew Carnegie Birthplace Museum gives a fascinating insight into the early life of the man who would become known the World over for his immense wealth. The famous Industrialist and Philanthropist was the epitome of the American Dream. Born in a small cottage in Dunfermline on 25th November 1835, the hand-loom weaver’s son had little in the way of formal education. Nothing about his early life hinted at the great success he would one day achieve. Carnegie never forgot his Scottish roots, or the town where he spent the first 13 years of his life before emigrating to America. He made generous charitable donations to Dunfermline, founding a public library and gifting the town a park. In the last 18 years of his life it’s estimated that Carnegie gifted around 90% of his vast wealth to good causes. I often find on my travels that the places I visit link tenuously to one another. I’d passed the grand Carnegie Hall regularly during my stay in New York, and here I was back in Scotland visiting the humble cottage where Carnegie was born. My favourite room was the one Carnegie was born in. Small and cramped, with a cosy range fire, it must have been a far cry from the houses he lived in, in later life. The boy loved the pretty garden at the back of the cottage, and enjoyed some chill time with his Dad as I looked round. Mr G it seems had reached his history quota for the day. Before lunch we took a quick stroll around town, stopping to admire the stunning salmon coloured Abbot House. Built in the 15th century, it’s the only domestic building to have survived a terrible fire that devastated the old town of Dunfermline in 1624. I loved the Dunfermline City Chambers building with its ornate carvings, turrets and gargoyles. It’s an eclectic mix of Gothic, Scottish Baronial and French architectural styles which somehow really works. Our last stop before hunger kicked in was the vast 76-acre Pittencrief Park, known locally as ‘The Glen’. The park was purchased by Andrew Carnegie in 1902 and gifted to the people of Dunfermline the following year. The quieter corners of The Glen had a really, peaceful and remote feel. Hidden amongst the greenery it was hard to believe that we were actually slap, bang in the centre of a bustling Fife town. In the more formally laid out part of the park, a statue of Andrew Carnegie has pride of place on a tall plinth. He stands, watching over the town where he spent the early years of his life – a town that benefitted greatly from his generosity. All great day trips should end with good food, so before heading home we made our way back to Cafe Fresh and enjoyed a tasty al-fresco lunch. Mr G was delighted to find his old favourite, haggis and cheese panini on the menu. The boy was delighted too as he’s partial to a wee taste haggis every now and again. I chose a home-made lasagne which was delicious, and exactly how I like it – slightly crispy round the edges, and with a rich meat sauce. I left Dunfermline having scraped the surface of the things I wanted to see and do there. I also left wondering why on Earth it’d taken me quite so long to revisit. Dunfermline is a wonderful town – it’s jam-packed with history, good eateries, quirky independent shops and lots of lovely green space. I’ll definitely be visiting again soon. A big thank you to Thomas at Visit Dunfermline for inviting us to visit, and for arranging our tour and lunch. Thanks also to Colin for showing us around and bringing the history of the town to life. And finally, thanks to the lovely staff at Dunfermline Abbey, Dunfermline Palace and the Andrew Carnegie Birthplace Museum for making us feel so welcome. As always all opinions, musings and comments contained within this blog are accurate and entirely my own. I don’t even know if you will see this comment, since your blogpost is from 2017, but Visit Dunfermline Facebook page just posted a link to it. I am from Dunfemline but have not lived there for 31 years. I am now in Leiden in the Netherlands, which has some similarities to Dunfermline but without the hills! Anyway, I thought you might be interested in a couple of things that I thought of while reading this post. Andrew Carnegie, did not only gift a public library to Dunfermline, it was the first of many libraries – 2,509 in total. There is a wikipedia page about them. He also gifted the public baths now Carnegie Leisure centre and a clinic nearby. The main thing I wanted to mention, because you referenced Carnegie Hall in NYC. Dunfermline has its own, albeit much smaller Carnegie Hall. In 1976, Billy Connolly brought out an LP called Atlantic Bridge. One side was recorded in Carnegie Hall NYC and the other in Carnegie Hall Dunfermline. I enjoyed reading your post and wish you many more travels in beautiful Scotland. It’s a great town. The historic aspect makes it really appealing for me and combined with good option for food, shopping and green space there’s something for everyone. I do love the reminisce over old toys too. I still have some of mine too. Toys and retro sweeties always take me down memory lane. Brilliant article and post. Loved all of the photographs. Dunfermline Abbey and “The Glen” were among the places the family and I went to on our Scottish Rail Pass Tour. I remember taking a photograph of my son John next to the Bruce in the Abbey but this was about 35 years ago and as I recall it was not as elaborate then as it is now in your photographs. The Museum had a small shop and I bought Annabell a bracelet there.I think she still has it. They’ve done some fantastic work in the Heritage Centre. It’s a great area to explore. So lovely that your Daughter still has the bracelet, what a lovely memento. What a beautiful restoration. A loss to Scotland but fantastic to see it find a new home in the USA. I know…I hate when people come in and rip out old buildings, etc. I felt the loss of several old buildings in the town I grew up in…including the John Ringling Towers, which was razed to make way for a Ritz-Carlton. I know it’s probably childish, but I never set foot in the Ritz, deliberately. Ha ha, I’d probably have done the same. *smiles* Anything old and vintage I love. Even Brutalist architecture. *laugh* What’s your favourite architecture? Small-world parallel(s) (Have I commented on this before? ): Dunfermline is the sister city of my hometown, Sarasota, Florida (US). A family member was the architect who did the design/oversaw the restoration project at the Asolo Theatre in Sarasota (they did several theatre historic preservation projects), which is where the interior of Dunfermline’s Opera House found a new home. Even better, though, our family’s favourite restaurant for brunch was run by a Scottish family, and one of them remembers actually seeing movies in there as a kid (when it was in Scotland, still). That’s amazing, thanks for sharing. I’m currently reading Neil Oliver’s A History of Scotland which I picked up in Ullapool last year. I read your blog then happened to pick up the book to read it and low and behold it was referencing Dunfermline Abbey! Funny coincidence. It’s a good read if you haven’t already. I love how Oliver brings history to life. He’s so passionate about Scotland and its history. Dunfermline Abbey is fascinating. Another very nicely done article, I envy your wordsmithing skills to make your posts lively and interesting.